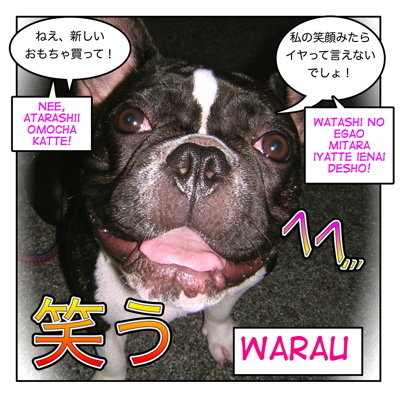 Today’s lesson is about 「笑う」” ( = warau) . It means “to laugh”. It is my favorite thing to do, and I do believe it is very important thing in life. We have a saying, 笑う門には福来る。 ( = Warau kado ni wa fuku kitaru.) Laughter will bring in luck. ←Luck will come to the family who always laughs. Let’s look at the kanji first. = Kanojo wa itsumo watashi no hetana jouku ni mo warau. = She always laughs even at my bad jokes. = Kare wa mawari no hito wo itsumo warawaseru. = He always makes people around him laugh. = Kare no gyagu wa hontou ni waraeru. = His gags really make me laugh. His gags are very funny. = Anoko niwa itsumo warawaserareru ne. = I always get a good laugh out that kid. -> That kid always makes me laugh. Note : Sometimes 笑う（ = warau) is used negatively. = Are de sensei nante hontou ni waracchau. = “The fact that he is a teacher is a big joke to me. = Sonna koto de watashi ga yurusu to omou nante warawasenaide! • 初笑い ( = hatsuwarai) the literal meaning is “the first laugh in a year”. Many comedy shows use this title during the New Year’s Holidays. When Japanese people get embarrased or puzzled, they smile to cover up their embarassment. This sometimes causes misunderstanding between Japanese people and foreign people if they don’t know the difference of culture. = Kanojo wa me ga au to boku ni hohoen da. = She smiled at me when she caught my eyes. = Kore wa warai goto dewa nai. =Waratte iru baai deewa nai. = You’re in no position to be laughing. Culture note : How do Japanese people laugh? =Onna no ko ga sonna ookina kuchi wo akete warau mono dewa arimasenyo. Mittomonai! 〜（と）笑う ( = ~to warau) to laugh making ~ sound. • あはは ( = ahaha) Haha! • ハハ ( = haha)　or ハハハ ( = hahaha)　Haha! • ワッハッハ ( = wahhahha) Stronger than ハハ… BuHaha! = Kodomo tachi wa nani wo mite mo kyakkya to warau. = Children laugh at whatever they see. = Ehehe to waratte gomakasu. = To fake one’s mistake by laughing. Note : えへへ..（ = ehehe) ＆ へへ..（ = hehe) both sound mischievous. OK, now I can go into お笑い ( = owarai) vocabulary. Japanese お笑い ( = owarai) stand-up comedy, is still very popular. Many young comedias are treated just like pop idols in Japan. 「お笑い」( = owarai) is very popular. It is very hard to find a TV program without seeing them. So if you want to communicate with young Japanese people, I will suggest to learn a bit about these 「お笑い」( = owarai) terms. it out in a funny way and makes the audience laugh. Note : In my previous, 「ドン引き」 ( = Donbiki) lesson, I mentioned that the word was originally a part of Japanese comedian lingo. There are many more lingos among professional comedians which have became a common word in our daily life. Kansai dialect or 大阪弁 ( = Ousaka ben), Osaka dialect because they sound very friendly and funny. (The comedy duo name was ツービート ( = Tuu Beato.) In Japan he is better known as ビートタケシ ( = Beato Takeshi). Every year, many new comedians debut and others disappear. Some become super popular and their gags became the trendy word or phrase for that year. You will hear their gags almost every day on TV or even in our daily conversation. Kids especially love to mimic them. disappear eventually and become 死語 ( = shigo) literally “dead words” that nobody uses anymore. If someone becomes very popular because of one gag, we call him 一発屋 ( = Ippatsuya) a one trick pony. Other owarai related words which have become common in conversational Japanese. •ネタ ( = neta) Fun or interesting topics to talk about. =Ano hito, nandemo neta ni suru ne. = Kyou wa neta ga nannimo nai. •ネタばれ（or ネタバレ）: a story that every can predict what is going to happen, a spoiler. = Hanashi no ochi ga nai. = There is no punch line for that story. = to have a punch line. = I made people laugh today. =Kono hon sugoku waraeru yo! = This book will make you laugh a lot! → This book is very funny! •「受ける!」( = ukeru) (= I get a kick out of it! –> It is funny! = Kare no hanashitte honto, ukeru! = His story really makes me laugh!→ His story is very funny! = Uke wo neratta anna koto wo yatta noni subetta. = He thought it would be a big hit and did such a thing but nobody laughed. = Aitsu kono aida, suggoku subette tayo. = Nobody laughed at his jokes the other day. = That joke really makes me laugh. It might be confusing for you to see some of the words are written in Katakana instead of Hiragana or Kanji. We tend to write colloquial words or experessions mixing up with Katakana. 笑顔は私の武器です。= Egao wa watashi no buki desu. = My smile is my weapon! = Mina mo kyou wa takusan waratte ii ichinichi wo sugoshite ne! = Laugh a lot and have a good day today,everyone! This is very interesting. How would you write “Laughing Creek.” The idea being the creek is personified. I would like to bring to mind a mountain stream. Would “笑う磎” be correct? But it is hard to imagine the situation. Can you explain this 「笑いあう」 ? 笑いあう means either to smile/laugh at each other or laugh “together”. Check my V+合う lesson. →Click here. Hi, I want to get a tattoo of the Japanese for laugh because it’s the best thing to do and I was born in Japan and lived there for 7 years. What is the word/phrase/kanji I should get? Hi, you posted the same question on Maggie’s room so I will answer there. Yes, (笑える or 笑っちゃう) you can also say “ウケる！= ukeru!” in colloquial Japanese. I personally would like to know the meaning of those expressions :-P. The only one I know is 「そんなの関係ね〜」. You mean the rest of the old gag lines? A lot of them are meaningless. You just have to see the old comedy shows. Thanks A LOT. I think 「ダメだこりゃ」 is also famous but a little older, right? My two favourite shows are personally 学べるニュース and ザ・ベスト・ハウス, I always learn something new :-). 「ダメだこりゃ」 (a gag line of いかりや長介 from ドリフターズ）is old but people still use it. ザ・ベスト・ハウス is very popular in Japan. I think that was scientifically proven actually…. This has been really helpful, i always get confused on how to use a word in a sentence so i appreciate all the examples…thanx a lot for the hard work! “Doumo Arigatou” for your comment! I will keep adding more words or phrases. There are tons of fun expressions from お笑い! Japanese comedy could be difficult because of they talk very fast and many of them use Kansaiben. If you have any questions, please ask me! Thank you!! I really learnt a lot from this lesson. Also, I’d been hearing ウケる a lot recently and didn’t really understand how to use it, but now I do! お久しぶりです！お元気でしたか？Since your Japanese’s comment is just perfect, I will write to you in Japanese.